The heat sealing process can be broken down into two fundamental types: 1) basic heat sealing, using heat and pressure and 2) ultrasonic welding, also known as heat staking. Each process comes with its own complications and challenges. In most cases, issues such as platen (also called a plate or bar) warping, platen pitting, insufficient platen pressure, platen planarity uniformity and plate misalignment can ultimately lead to inconsistent temperature and bonding issues, requiring maintenance and engineering support and could even cause line down situations if undetected. Basic Heat Sealing, performed using heat and pressure for a set amount of time (dwell time), bonds two thermoplastic materials together to form a seal through direct contact with a heated plate or sealing bar. In some applications, an adhesive or substrate is used, activated by the heat and pressure from the sealing plates to form the required bond. Ultrasonic Welding, (sometimes referred to as heat staking) uses ultrasonic acoustic vibrations to create a bond, typically in plastics, by melting the materials together. The process is an efficient manufacturing alternative to glues or other fasteners such as screws or nails and can be automated during production. By utilizing tactile pressure sensors such as Fujifilm Prescale, problems from quality control to maintenance issues can be diagnosed using accurate, real time data. Prior to any run, engineers and technicians can ensure that platens are properly aligned and applying the needed pressure and the machinery is free of defects. Heat Seal Planarity - With printed circuit boards (PCBs), one of the common reasons the PCB is rejected during the manufacturing process is a poor connector bond, formed by heat sealing. Plastic heat seal equipment must be able to consistently apply uniform pressure (at least 20 kg/cm2) and temperature (at least 120 degrees C). To accomplish this, the machine must be designed to handle the force stress of the heat sealing process. Over time, the bonding blade will lose planarity and develop inconsistent sealing pressure, allowing a weak bond to be formed, eventually resulting in quality control issues or rejected parts. 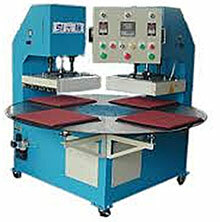 The amount of pressure applied by a heat seal press is low, typically up to 350 PSI (25kg/cm2). The Super Low (LLW) Fujifilm Prescale sensor film ranges from 70-350 PSI. To use, place the sensor film between the bonding blade and the heat seal platen and apply a normal operating load. Once the film is removed from between the platens, the pressure measurement will be visible on the film via color change. Refer to the Prescale color correlation chart to further analyze the results, taking into consideration temperature and relative humidity. Further analysis also can be made using the Topaq Pressure Analysis System to get an increased visualization of the pressure variations across the desired surface area. Note: Liquids and oils from skin contact can damage the film and potentially skew the outcome. It is also important to assure the proper pressure recording film is used, based on the required pressure rating, chosen between the seven available options, ranging from Ultra Extremely Low (0.87 - 7.3 PSI) to Super High (18,500 to 43,200 PSI).